He died at a hospital in Appleton, Minnesota after suffering a heart attack at the Swift County Fair in Minnesota. His funeral was held at St. John's Catholic Church in Appleton, Minnesota and he was buried in the Appleton City Cemetery. "Representative Chuck Brown Remembered." Session Weekly, St. Paul: Minnesota House of Representatives Information Office, February 6, 2004, p. 11. Yost, Dana. "SSU Alumnus Brown, a Former State Lawmaker, Dies at 52 (Obituary)." Marshall Independent, August 19, 2003. Salisbury, Bill. "Auctioneer, Former State Rep. Chuck Brown Dies. (Obituary)." St. Paul Pioneer Press, August 17, 2003. Hahn, Trudi. 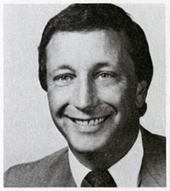 "Farmer Advocate, Former State Rep. Chuck Brown Dies (Obituary)." Star Tribune, August 16, 2003. "Five More House Members Announce Retirement." Session Weekly, St. Paul: Minnesota House of Representatives Information Office, April 12, 1996, p. 42.